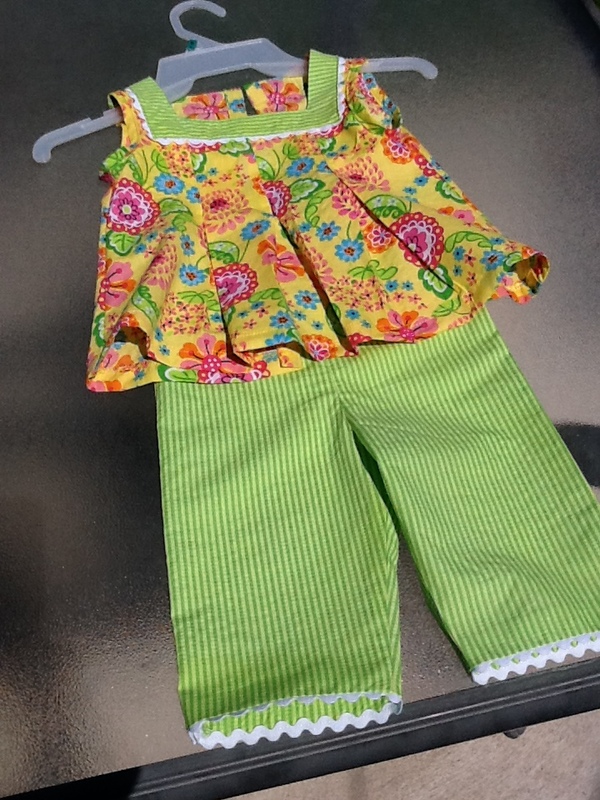 I made two of these outfits for granddaughters Emma and Allison. It was an easy sew, but when they came to visit, I found out the pants didn’t fit. Sewing long distance has it’s challenges! 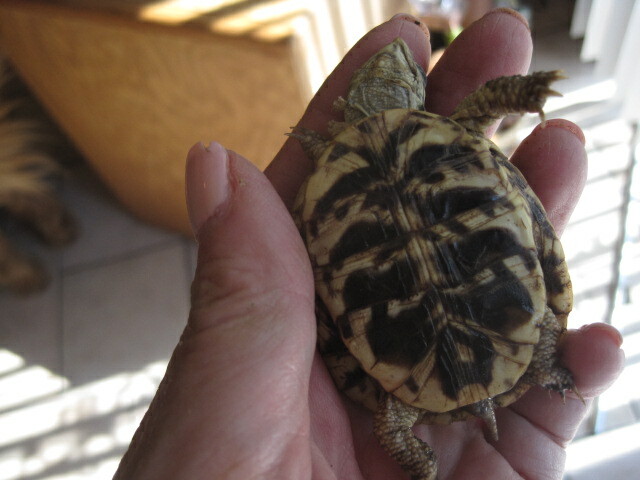 She hatched in 2009 and is three years old this spring. On the second picture her growth rings show she’s 3 years old. 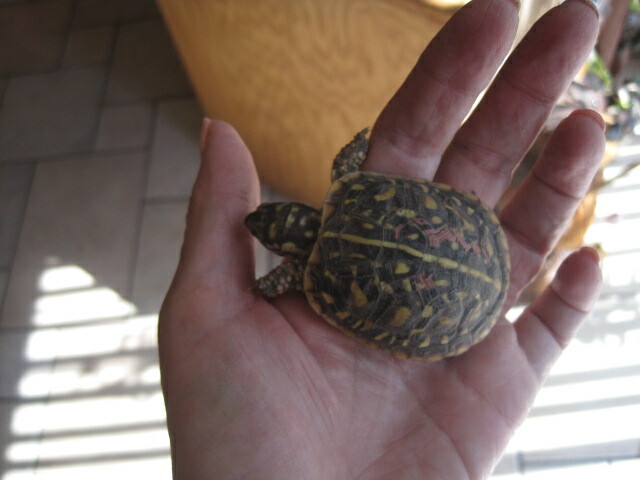 Last year I counted and numbered 10 tortoises. Six have come to breakfast so far this year. The others are munching on bugs and vegetation. They’ll come to the door as the weather gets hotter. It’s been a few months (really?) since I updated here. Time has flown, as it always does, with day-to-day events filling the hours. I have managed to complete the applique for my version of the the Red Delicious BOM designed by Esther Aliu from Australia. 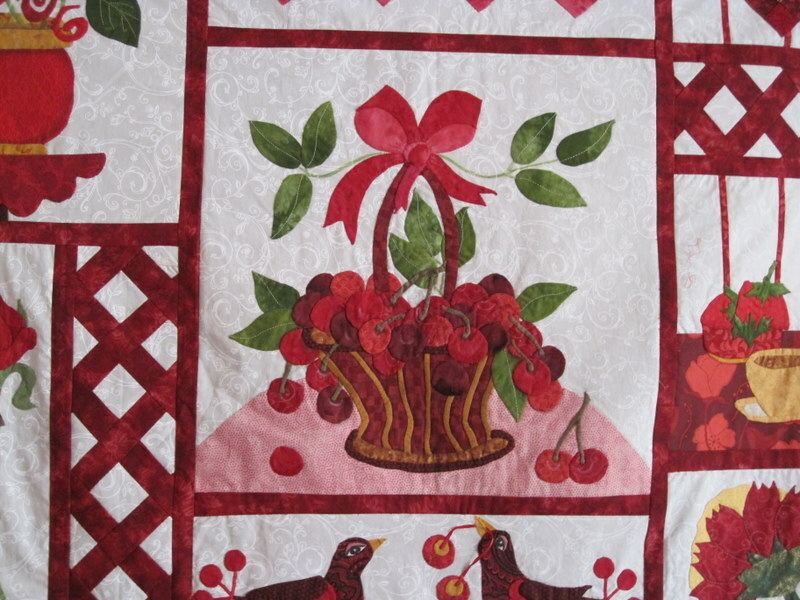 When I started the project in November 2008, I was looking for an applique project to energize me to become more active in quilting and applique in particular. I truly enjoyed making this. I made some changes to her design here and there. I began to lag behind in the monthly blocks and finally realized that I didn’t want another UFO, so this fall I pushed forward to finish the big center cherry basket block. Once that was done, I changed her swirls to lattice, and substituted roses in the upper left. Yea, the hard part is done, just borders and quilting left. Here’s a peek of the top hanging in the dining room which will become it’s home once I finish it. I’m starting my 2010 project. It’s a portrait of Sarah and Emma. I used Photoshop to posterize the snapshot and find the edges of the various shapes and colors. Kinko’s was able to enlarge it to 300%. 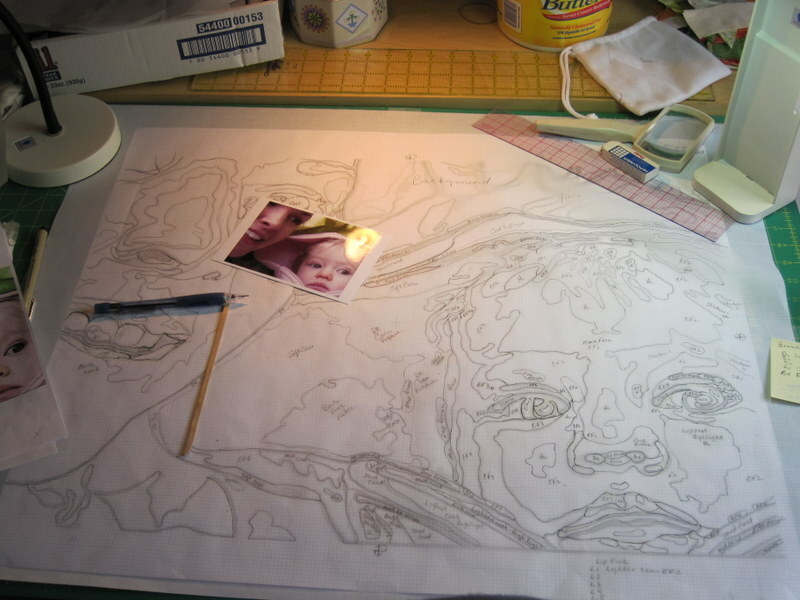 What you see is a velium line drawing of the underlying print. It’s taken a couple of days off and on to get it to this stage. The lips were the most difficult to interpret, and I may have to make adjustments when it comes to stitching those areas. I would like to have this finished by the end of summer — only time will tell. In January (wait — it’s still January!) I went to the Road to California Show in Ontario with my BFF Loretta. I was very happy to see Cherrywood fabrics there. Cherrywood does gradations of hand-dyes including skin tones. I helped with their bottom line and bought one of everything I thought might work on this project. 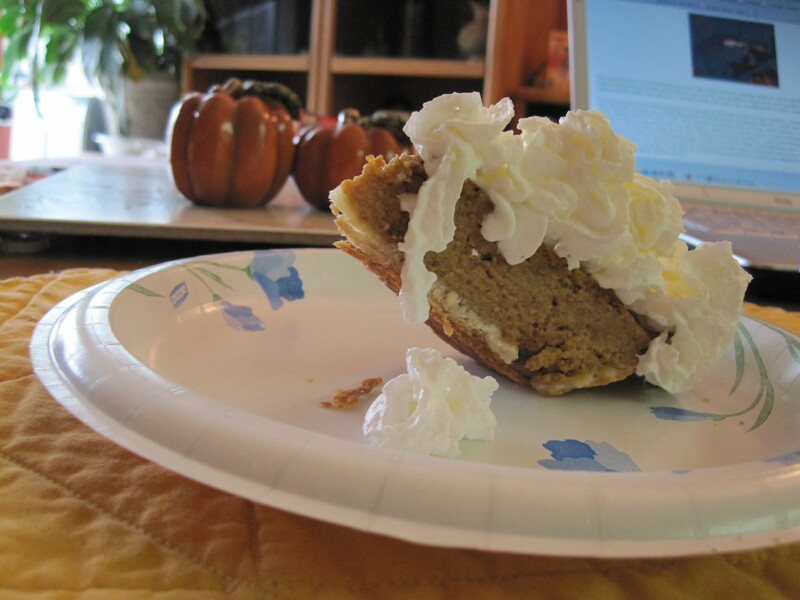 Too much whipped cream or Not enough pie? Finally finished! Today a couple of knitting friends came over for coffee. 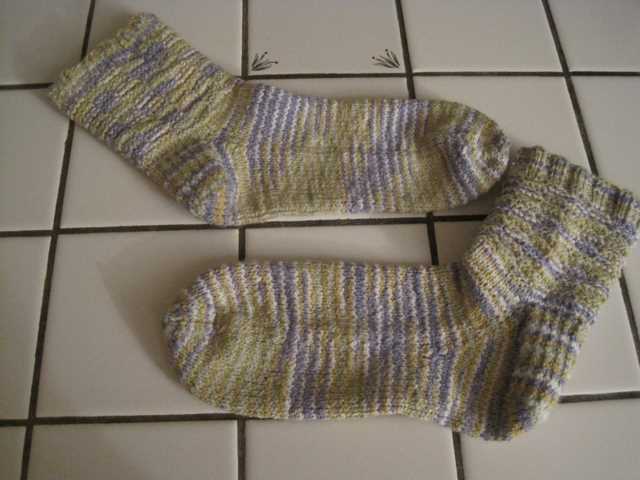 Kathryn was working on a pair of socks for her daughter and it made me realize I had a pair in a bag somewhere waiting to be finished. I drug them out and in a couple of hours the toes were finished. Yea!! one less UFO. These are made out of 98% cotton and 2% elastic. I love the fit that the elastic provides. I was sitting at my computer this afternoon when a beautiful roadrunner came right up to the patio door. The door is about 1o feet away from my computer and that’s as close as I’ve been to one of these birds. My camera was just a reach away, but by the time I could get to it, he had started to move away. I was able to catch a few shots of him however the zoom on my lens is not strong enough. I’m amazed at how tall he stood, maybe 18″ or so with his crown up. As I was raking the leaves yesterday afternoon, I remembered how fun it was when my Dad would rake the leaves to form walls for me to play in. I did that yesterday thinking of Emma and how when she’s a bit older she will enjoy playing in the leaves. They smell so sweet. My main concern was to get them off the sidewalk in case it would snow. I hadn’t checked the forecast, but sure enough about an hour later the white stuff started to fall. By the time I raked, used the blower over the gravel areas, and bagged I was ready for a nap. We only got three large bags filled. Here’s what it looks like this morning. It won’t get done today, but maybe this weekend the rest of the leaves will fall and I can get it all bagged up. I do wish we had a city service with would come and vacuum up piles of yard debris, how easy that would be!